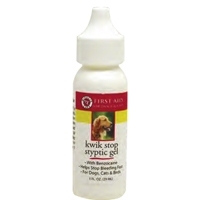 Gimborn Kwik Stop Styptic Gel 1 oz. 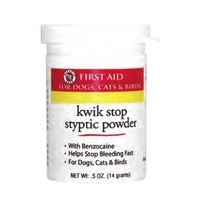 Forms an instant gel barrier to stop bleeding fast. Great to have on-hand for emergencies or bleeding caused by clipping nails, docking tails, wing clipping, or minor superficial cuts. Easy to apply, no-mess gel formula. 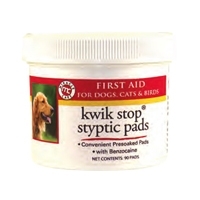 Stop Styptic Pads help stop bleeding fast for dogs, cats, and birds. 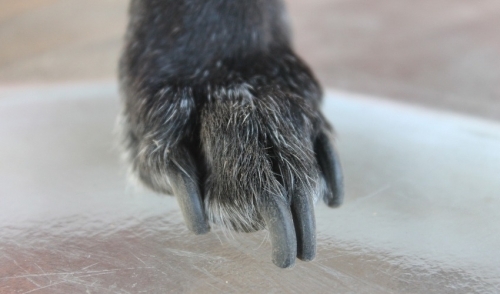 They are an easy-to-use and specially formulated to aid in the control of minor bleeding caused by clipping nails, docking tails, wing clipping and minor cuts. Instructions: Remove a pad and apply it directly to the cut, nail or other superficial bleeding area with moderate pressure for 5-10 seconds. Do not use in deep wounds, body cavities or on burns. If desired results are not obtained, consult a veterinarian.